“Media has a significant role in the theatre of the absurd,” a participant in a conference on the security and protection of journalists in western Balkan countries claimed. Media workers and representatives from journalists’ associations in Croatia, Bosnia and Herzegovina, Serbia and Montenegro joined representatives of international organisations in Sarajevo in June 2015 to debate key issues facing the media in the region: attacks on journalists, impunity, the effectiveness of the legal system and institutional mechanisms to create a safe environment to work in. Conference participants said media freedom is deteriorating and assigned responsibility for the decline on governments in the region, local media ownership and, especially, international institutions and organisations. Goran Miletic, programme director for the western Balkans at Civil Rights Defenders, an NGO working in the area, said that in 2004 some of the international organisations decided to withdraw funding from local media to focus on other projects. Miletic said that reduced level of funding for media was a lost opportunity to prevent human rights abuses and further democratise the region. International funding is vital to professionalising the media, which cannot rely on local government support. “If we analyse research on what people think of human rights defenders or journalists, they are often characterised as spies, foreign mercenaries, or enemies of the state,” said Miletic. A lack of media plurality and news illiteracy were identified as concerns that have had a detrimental effect on the advancement of press freedom and professionalism in the region. “Media freedom is once again one of the key challenges for the region,” said Andy McGuffie, head of the communication office of the Delegation of the European Union to Bosnia and Herzegovina and a European Union Special Representative. Croatia has a checkered history on media freedom. During the 1990s journalists were widely targeted and were under surveillance by the secret service. In the 2000s, the journalist Ivo Pukanic, was assassinated in a bomb attack at his Zagreb office. Though a court convicted six men for the murder, the person who ordered the crime has not been brought to justice. Duka emphasised two 2014 physical assaults: an incident in Rijeka in which football club officials attacked a journalist and a photographer and the brutal attack on journalist Domagoj Margetic who was assaulted by several people near his home in Zagreb. Margetic sustained head injuries as a result of the attack, for which he received medical treatment. Sanja Mikleusevic-Pavic, a journalist from Zagreb, agreed with Duka. “Croatia is in a much better situation than other countries,” she said. Key reasons for this include the Trade Union and the Journalists’ Association, which are very well organised and powerful, but most of all, the key role played by the public broadcaster HRT. “HRT is a strong, independent and professional public broadcaster,” said Mikleusevic-Pavic. From her point of view, the main threat to independence and professionalism are pressures from tycoons and politicians, which, in her experience, are significant. The case of Croatian TV broadcaster RTL, which was found guilty of slander for airing a live show during which Croatian Prime Minister Zoran Milanovic accused Zagreb Mayor Milan Bandic of corruption, sets a negative precedent, particularly because another TV station that aired the same statement was not charged. As punishment, RTL has been ordered to pay 6,500 euros to the mayor. In April 2014, Jutarnji List journalist Slavica Lukic became the first Croatian journalist to be prosecuted under the article. She was found guilty of vilification. Lukic reported that a company had economic problems despite the substantial public funding it received. The company stated it felt “humiliated” and the judge fined her 4,000 Euros. Duka said that there are more than 40 criminal insult cases pending against journalists in the country and this is clear evidence that “truth can be punishable.” Furthermore, he believes judges are not well prepared for defamation, slander and libel cases. Defamation in Croatia has not been decriminalised as it has been in Montenegro, Serbia and Bosnia and Herzegovina. “The situation in Serbia is alarming. As long as there is a brutal assault on journalists, we cannot talk about freedom of speech and media freedom,” Vukasin Obradovic, president of the Independent Journalists’ Association of Serbia (NUNS), said in a speech at the conference. From 2008 to 2014, Serbia has seen a total of 365 physical and verbal assaults, intimidation and attacks on the property of media professionals. 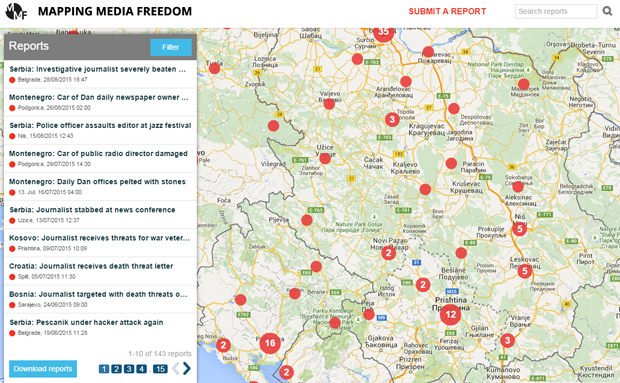 Since May 2014 alone, Index’s European Union-funded Mapping Media Freedom project has received over 48 reports of violations against Serbian media, including attacks to property, intimidation and physical violence. Anastasijevic was targeted because of his investigative reporting on crimes in the former Yugoslavia and criminal syndicates in Serbia, local media reported. The most recent attack followed Anastasijevic’s criticism of a lenient verdict for members of Serb paramilitaries called “Scorpions,” journalists associations said. The case has still not been resolved. Obradovic emphasised that attacks on journalists in Belgrade often get more attention than violations that take place outside the capital. Vladimir Mitric, a journalist from the town of Loznica, has been under police protection since October 2005 after being subjected to a brutal assault. He was attacked as he entered his apartment and struck with a blunt instrument from behind several times. He ended up with a broken hand and was very badly bruised all over his body. He is disabled as a result of that attack. “I live under police protection that I was granted by court, not police, at my request, which is important,” said Mitric in an interview with SEEMO. A former police officer was identified as the attacker and was sentenced to six months in jail by the Loznica Basic Court. The Belgrade Court of Appeal later doubled the sentence. Sladjana Novosel, a journalist from Novi Pazar, was targeted three times between September 2010 and March 2013. Novosel was subjected to verbal attacks, shaming and bullying. Police have, so far, failed to pursue investigations of these threats. In another incident, Davor Pasalic, the editor-in-chief of FoNet, was attacked twice early in the morning of 3 July 2014 as he made his way home from his office. The two attacks left him with cuts and bruises, and four of his teeth were broken or knocked out. After seven months of investigation and zero progress, Pasalic sarcastically said that his case is “no big deal.” But he added that the assault has had no impact on his work. Branislava Opranovic, member of the executive board of the Independent Journalists’ Association of Vojvodina (NDNV), focused on economic issues and ownership transparency in the media. She described the lack of ownership transparency in the media, sharing her personal experience. “I have been working for the daily Dnevnik for years and years, but still don’t know who the owner of the newspaper is.” She also mentioned other cases, including one where a man in his twenties wanted to buy nine media outlets in Vojvodina, or the episode where her coworkers were waiting patiently in a line to collect bonuses of 5 Euros despite having not received their salaries. In that incident, police entered and searched Klix.ba’s Sarajevo offices for a recording of a phone call in which the Republika Srpska Prime Minister Željka Cvijanović talks about “buying off” politicians. Local media reported that police were copying material from the newsroom’s computers. The police also seized computers, documents, notes and other items from the offices, according to media reports. Despite positive developments in the law over the past 15 years, the situation has shown little improvement, as institutions are failing to properly implement new legislation, meaning protection on journalists is weak. Between 2006 and 2014, there have been approximately 400 registered cases of media rights violations, including 40 physical assaults and 17 death threats. Bosnian journalists use a name and shame strategy, in which the identity of every person who threatens or attacks a journalist is publicised. Rudic said that the most serious incident was the attack of Professor Slavo Kukic, a prominent writer and columnist, who was severely beaten with a baseball bat in his office at the University of Mostar, on 23 June 2014. Marko, a journalist present at the event, shared his and a colleague’s personal experiences. While working for a public broadcaster they were both victims of constant harassment by one of their deputy editors, receiving no support from senior editors or directors. This resulted in them both being admitted to a psychiatric hospital for mental health issues. Montenegrin TV host and journalist, Darko Ivanovic, told how one of his country’s prominent politicians stated: “it is customary law to hit journalists,” when asked why he slapped a journalist. Over the last few years Ivanovic has had his car vandalised on a number of occasions, though only one incident resulted in the arrest of a suspect, who admitted the vandalism. However, when interviewed by Ivanovic, the suspect admitted that the police gave him 5 Euros so he confessed to the crime. “There is always someone found guilty, but usually they’re not the real perpetrators. And this puts into the question the effectiveness of the system,” Ivanovic said. Tabloids in Montenegro are used for smear campaigns. Civil rights activist Vanja Calovic became the victim of just such a campaign by Informer, a daily newspaper. The tabloid’s mid-June attack against the head of the MANS NGO began with the release of a video recording that, according to the paper, proved that Calovic was “an animal abuser” and alleged that she had sexual relations with her dogs. The NGO Human Rights Action (HRA) highlighted the perilous state of journalism in its report, “Prosecution of Attacks on Journalists in Montenegro”. The HRA outlined 30 cases of threats, violence and assassinations of journalists as well as attacks on media property between May 2004 and January 2014. “Most of these attacks have not been clarified to date. In most cases certain patterns can be observed, for example: victims are the media or individuals willing to criticise the government or organised crime,” the report said. The assassination of Editor-in-chief of the Daily Dan, Dusko Jovanovic, who was killed in a drive-by shooting on the evening of 27 May 2004, has not been solved nine years later. Damir Mandic, the only defendant in the recent trial, claims he is innocent and accused the police of planting evidence, Balkan Insight reported. Mandic said he was in prison for 10 years although he was innocent, and his human rights had been violated. He remains the only perpetrator to be convicted. Seven years after the brutal attack that nearly took the life of journalist Tufik Softic, Montenegrin police detained two men suspected of involvement in his attempted murder. For media unions and observers, the detentions were long overdue, but emblematic of the atmosphere of impunity in Montenegro. In November 2007, Softic was brutally beaten in front of his home by two hooded assailants wielding baseball bats. Then in August 2013, an explosive device was thrown into the yard of his family home. The journalist has been provided with constant police security since February 2014. Besides this atmosphere of impunity that threatens journalists, Camovic spoke of other phenomena. Approximately 80 per cent of all active media workers in Montenegro are not members of any journalist’s association. When asked why they’re not active in the organisations, they had no answer. In summing up the situation, Ivanovic said that states and political parties deliberately tolerate grey or criminal activities of media owners so they can control them easily.